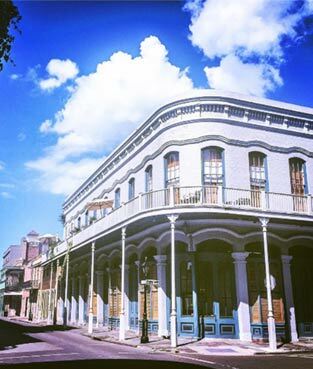 Visit The Swamps Of Louisiana | Experience New Orleans! Just a short drive from New Orleans are a number of picturesque Louisiana swamps, filled with exotic wildlife and beautiful plantlife – not to mention Cajun culture. The best swamp tours in New Orleans, featured here, offer fascinating guides who grew up in these mysterious swamps. They know how to maneuver through these ancient waterways and, just as important, they know how to weave a yarn. Get outside the city for a couple of hours and explore the undeveloped reaches of Louisiana, dripping with Spanish moss and dotted with gnarled cypress trees. You're sure to encounter swamp wildlife like alligators, wild boar, huge cranes and other magnificent bird species, nutria, mink, racoons, turtles and snakes. You'll learn about the pirates that once hid in these wild and pristine river swamps and hear legends of swamp monsters. You may even get to hold an alligator and pose for a selfie. After your first New Orleans swamp tour, you'll want to go back again and again to keep exploring. Learn more about the swamps and the wildlife that inhabit them. 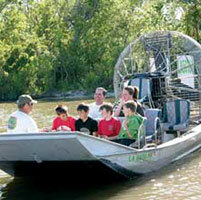 Honey Island Swamp Tours, Inc.
New Orleans is a city surrounded by swampland, virtually making it a low-lying island. In fact, it is second only to Death Valley as the lowest area in the country. The swamps of New Orleans are among its most beautiful attractions. The bayou is often considered a dark, foreboding territory which offers some of the wildest nature to be found on earth. Although considered mysterious by many, the swamps should be appreciated for their natural beauty and amazing plant and animal life. The list of wildlife in a cypress swamp is long (it is not uncommon to see alligators), and it is said that a list of the different shrubs and vines would fill a telephone book! 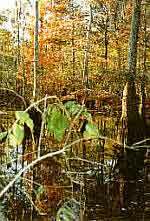 Swamps were long considered forbidden lands by some, and in the last several hundred years, many have been drained for their tremendous agricultural potential and for the value of the cypress wood. They were also drained by settlers who wanted to convert them into land for homes, and by lumber barons who exploited the area for its timber resources (cypress has always been in great demand because of its rot-resistant qualities). As settlement spread, fewer places were left to hunt, fish, and enjoy nature. Eventually, swamps were recognized as a retreat for wildlife and a place where Louisianians could find solitude and enjoy a variety of recreational activities. Our area swamps have also given rise to several legends. It is said that Jean Lafitte, the noted pirate and hero of the Battle of New Orleans, made a living off pirate booty worth millions buried in the marshes. The most famous stories of all swamp lore are the reported sightings of the legendary Bigfoot (a.k.a. the Honey Island Swamp Monster.) Sightings of the shy giant have been reported as far back as the earliest recorded contact with native Indians. Have you ever visited the swamp by boat or hiked along its walking trails? Have you ever seen Louisiana's egrets, herons, pelicans and alligators in their natural habitat? Inhabiting the swamps are animals, reptiles, amphibians, insects, and birds of all types. The most worrisome are, of course, snakes and alligators. While there are many non-poisonous snakes (there are only six poisonous varieties in Louisiana), one must watch out for water moccasins (cottonmouths), which may be underfoot or lurking in the trees above. Their bites can be deadly. Alligators should be respected, too. 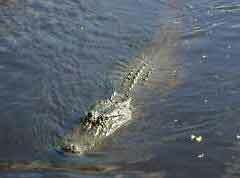 Even small gators (from five to six feet long) can cause severe injury. They can grow to be as large as 14 to 18 feet in length. American Alligators alternate between lying in the water and on the banks as a means of regulating their body temperature, and are most active during the warmer months. Since they often lie perfectly still, it is easy to mistake one for a log, and then it may be too late to escape! Several varieties of turtles can be seen on Louisiana swamp logs and banks, including snapping turtles. Birds abound, including snowy egrets, blue herons, pelicans, and since Louisiana is along the migratory flyway, you will often see ducks and geese. Nutrias (originally imported from South America) have found our swamps to be to their liking as well. And let's not forget our famous insects: mosquitoes and spiders. There are several state and national parks and wildlife refuges surrounding New Orleans that provide the public with access and swamp tours. Bayou Sauvage Wildlife Refuge to the east of New Orleans and Jean Lafitte National Historical Park to the south of New Orleans are two that are readily accessible.